Cramming even more stuff into an old backpack that’s already bursting at the seams isn’t good for your back or your stuff. Maybe it’s time to invest in a new one that can hold more while keeping it organized at the same time. The Osprey backpack line is known to excel at creating some of the best-made bags on the market. Although you can’t go wrong choosing either one of the backpacks in this article, each model is crafted with slightly different features that may be pros or cons for you. 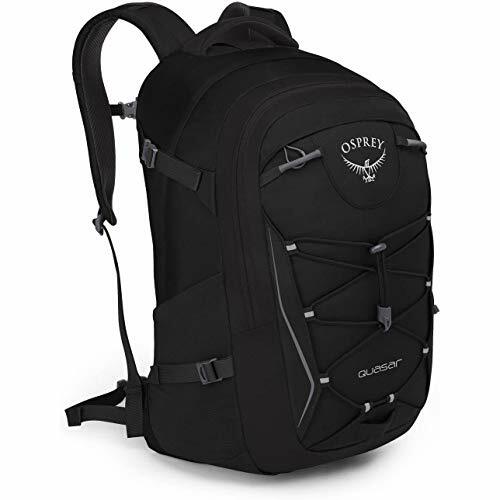 In this article, we will be reviewing the Osprey Packs Quasar versus the Osprey Comet. We will give you a closer look at the similarities and differences between the backpacks and which is suited to different lifestyles. Check Price 30 Liters 1.94 Lbs. Check Price 28 Liters 1.69 Lbs. The Quasar and Comet backpacks have been designed for school or daily use. However, you’ll find that the high-quality materials mean that they can also be used for hiking. This is because of their versatile design which works both in the classroom and outdoors. You’ll have enough compartments and space to carry all of your equipment or essentials. A laptop sleeve has been included in the design because it keeps your computer cushioned and protected. After all, how many students or workers travel without their laptops? For both models, there is a hanging padded laptop sleeve which ensures the safety of your computer and keeps it slightly above the bottom of the bag. This feature protects your computer from getting damaged if the bottom of the backpack hits the ground. The comet and quasar both include internal pockets to help keep your possessions organized. The inside of the compartments includes small, medium and large pockets so that you can place your credit cards, phones, tablets, laptop, pens, keys, and anything else in the compartments. On the outside of each backpack are side mesh pockets. These can be used to store water bottles, thermoses, or other small objects that you want at arm’s reach. Both backpacks also include blinker light attachments to help keep you safe when you’re out on the street near traffic. Many packs forget this element, as they assume that you’ll be carrying another accessory which can help drivers locate you on the side of the road. When it comes to safety, Osprey backpacks want to keep you protected. This is useful if you’re planning to buy either backpack for middle school or high school kids, as they will be safer when they walk to school. Located on the Quasar is an external bungee cord which allows you to store your jacket without having to open up the main compartment. This makes it easier to stash away outerwear on days where you’re unsure if it’s going to rain. You can take it to the gym or sporting events where you’ll be changing clothes. The Comet, on the other hand, lacks this convenient feature. Though both have the traditional top handle you’d expect on a backpack, the Comet features a front handle as well. This may not be of particular interest to you, but think about how much weight the backpack will hold and where you’ll be taking it. Many people find that it’s much easier to move the backpack with the additional handle, as it allows you to easily place and remove it from the overhead compartments on an airplane or a bus. Backpack users differ sharply on the desirability of hip belts – if you don’t buckle it, the hip belt that continually slaps against your sides when you’re not using it. The Comet features a removable hip belt that can be completely detached from the backpack. You can reattach it to be more comfortable when you’re riding a bike or carrying a lot of weight. The Comet and Quasar both feature padded laptop sleeves, internal organization pockets, side mesh pockets, and blinker attachments. When we compare these to other backpacks on the market, we find that these two bags excel at what they were designed for. Not only do you get extra space, but your possessions will also be protected by the padding. The Quasar includes a convenient external bungee cord which provides you with storage for your jacket. This isn’t exactly a main feature, but it’s useful for those of you who get tired of stuffing your rain-soaked outerwear into your backpack and finding that you’ve gotten your laptop, papers, and lunch wet. The Comet comes with a front panel handle and a removable hip belt. While not absolutely necessary, these features do provide you with more comfort. The handle gives you a versatile method for both carrying and storing the bag, and the removable hip belt provides you with the option to wear the backpack the way you want to. However, if you’re worried about losing the belt, you may be better off with one that’s attached. These backpacks are very similar, so it’s tough to pick a clear winner. No matter which one you choose, you’ll be satisfied with the product. It comes down to the smallest details which make the two (Osprey Packs Quasar and the Osprey Comet) backpacks different. Are you looking for a model that is more customizable for your comfort? If so then we’d recommend the Comet. However, if you’re looking for a bag to keep your outerwear from affecting the rest of your possessions, then we’d suggest the Quasar.